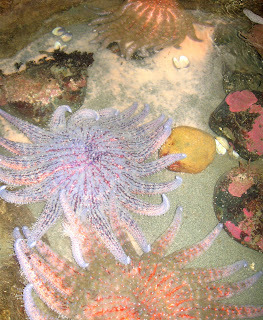 PTMSC Blog : Spawning of Sunflower Stars and Christmas Anenomes!! Spawning of Sunflower Stars and Christmas Anenomes!! Sunflower Stars (Pycnopodia helianthoides) in Touch Tank 4. Notice the orange tint to the eggs deposited by the sunflower stars. Eggs being released by the Christmas Anenome (Urticina crassicornis). All pictures taken by Allison Gravis. This nice week of warmer weather makes it seem like spring has come early here at PTMSC. Our tanks are swimming with potential life as the Sunflower Stars and Christmas Anemones have begun spawning! Earlier this week I was concerned about the health of one of our Christmas Anemones. While checking on the animals I noticed a milky layer in Touch Tank 4. The next day I noticed more milky residue in the tank. Chrissy and I surmised that the anemones must be reproducing! This chemical change in the water triggered other anemones in the tank to begin releasing eggs in response to the sperm. Although Christmas Anemones (Urticina crassicornis) often reproduce asexually by longitudinal fission or by pedal laceration, it appears some of the anemones in our tank are reproducing sexually! Urticina crassicornis are hermaphroditic animals; having both male and female reproductive systems, they either produce sperm or eggs, but not both at the same time. Eggs are then fertilized in the gastrovascular cavity of the animal. This produces planula larva that is a free-swimming ciliated polyip until it attaches itself on a rock. After 12 days of settlement 8 tentacles will appear. 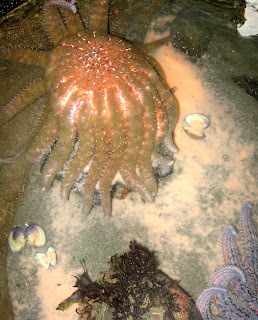 More tentacles will grow as time passes and the anemone has a reliable food source. 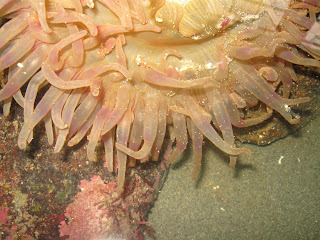 The anemone will be sexually mature after about a year, at 10-15mm in diameter, with 35 tentacles. According to fellow staff members our Sunflower Stars (Pycnopodia helianthoides) did not begin spawning until last summer. After reading sources online though I found that they commonly spawn from March-July, peaking in May and June. Sunflower stars are not sexually dimorphic, meaning that we cannot tell the difference between males and females. When preparing to spawn, the Sunflower Star hoists the majority of it's body off the substrate it is attached to in an effort to release gametes into the ocean for external fertilization. Larva will then float near the surface for 2-10 weeks and later settle on the ocean floor in a planktonic form developing into a juvenile sea star with 5 arms. More arms will continue to grow as the sea star matures. Perhaps we will see some juvenile anemones and sunflower stars in a few months...if they don't wash out our outflow grates!